Analysis of uncertainty and sensitivity is important but too seldom carried out. Life cycle assessments are normally made without quantitative estimations of accuracy or precision. In SETAC's 'Code of practice' (1993) sensitivity and uncertainty analysis are recommended, but the methodology is not very well developed. In the ISO 14040 sensitivity analysis is requested (ISO 1997a). The topic has attracted attention recently. 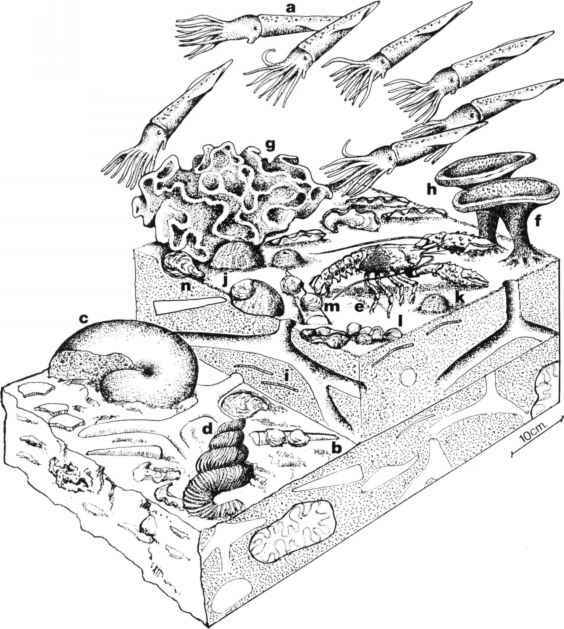 Hoffman et al. (1994) reviewed statistical analysis and uncertainties in relation to LCA discussing technical, methodological and epistemological uncertainty (for example, from lack of knowledge of system behavior). Heijungs (1997b) developed a sort of sensitivity analysis called 'dominance analysis', where the most important contributions to the result are identified. Kennedy et al. (1996) make an uncertainty analysis of the inventory part of an LCA using beta distributions. Steen (1997) developed a technique to estimate the sensitivity of ranking to uncertainty in input parameters. The outcome of an impact evaluation may be uncertain owing to uncertainties in input parameters, models or system borders. Depending on the goal and scope, more or less uncertain data and models may be included. Uncertainties in input data may be of several types: (a) uncertainties due to sampling from a population with true variation; (b) episte-mological uncertainties (using data in another context than that where it was generated); and (c) measurement errors. It is often claimed that estimating uncertainty is itself too uncertain, and this is in turn used as an argument to omit an uncertainty analysis. It must be remembered, though, that the difference in uncertainty between different input parameters can be very large, as much as several orders of magnitude. It is of great value to find out if the result of an impact evaluation is accurate within a few per cent or whether it can vary by an order of magnitude or more. 2 ij. 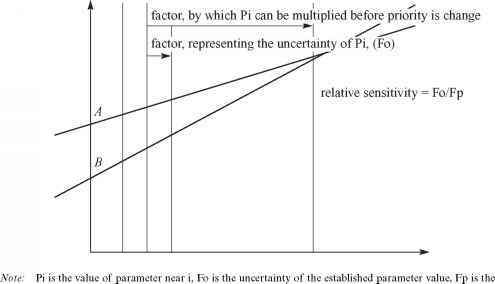 j. vk where j is the jth inventory result, kjk the characterization factor between inventory parameter J and impact indicator k, and vk is the weighting factor for impact indicator k.
change in Pi that can occur before priority changes. Figure 13.4 The aggregated impact value is linearly dependent on all input data change in Pi that can occur before priority changes. Figure 13.4 The aggregated impact value is linearly dependent on all input data the corresponding inventory parameter value for alternative A is less than for alternative B, the corresponding slope is less. Clearly the priority will change if the characterization factor value increases beyond a certain level. The ranking will thus be less sensitive to uncertainties in impact evaluation factors k and v, which are normally used for evaluating both A and B, than for errors in i, which is presumed to be unique to either A or B. Once there is an impact evaluation model established, the sensitivity of any of the outcomes to any of the inputs may be calculated. A common way of using sensitivity results is to sort them in order of size or magnitude. Then one may find the most important input parameters and this may yield ideas for improvement of technology or input data. However, some of these finding may be quite arbitrary, resulting from the way primary data were sorted and aggregated. For instance, suppose the sensitivity of an impact evaluation turned out to be much greater for emissions from the USA than from Luxembourg. If such a sensitivity analysis were used for directing abatement measures for the USA and not for Luxembourg, it is easy to see that something is wrong. Unfortunately, it is not always as easy to recognize such nonsense results when dealing with data from industrial systems.